It's been a long productive summer. I've been spending most of it making work and building a new studio. That hasn't let much time for blogging, but I shall return more regularly soon. Or perhaps I'll come to my senses and just link this blog up with my Tumblr. Simplify things. For now, I'm most active on Instagram. If you'd like to keep up, find me there. 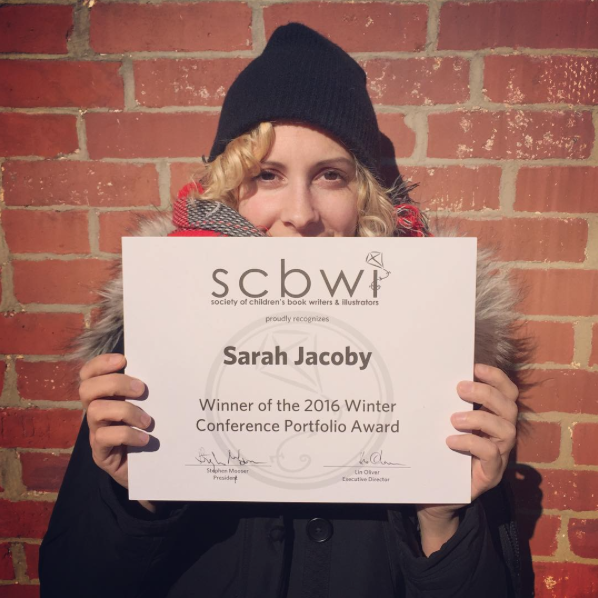 I left my full time job the day before this year’s SCBWI winter conference. I had been working as a production designer at a children’s app start up company in Brooklyn. The company is a wonderful one so as I settled in for the Illustrator’s Intensive at 8am in the Grand Hyatt on Friday I was feeling a wistful and emotionally unsteady, not entirely sure if I was making good life choices. Conferences are weird. Have you been to overnight camp? It’s like a concentrated version of that. Two days of intensive gatherings resulting in long lasting, longform letter-writing type relationships. There are people who return annually; little crews that know the scene deeply and can anticipate when the coffee will be taken away. I happen to sit next to such a group on Friday. “You should get two cups now,” I was told, “the free stuff’s gone in an hour.” This was the start of days of solid advice. I try to be open to feedback. Two years ago I graduated from an illustration MFA program and received varied criticism on my thesis project. I had illustrated a personal picture book of sorts. It was a long, wordless narrative about a girl walking through the woods with her dog. Nothing really happened in the book. The characters just walked together. I loved it. The goal wasn’t to make a commercial product. It was my first time really making a book like that, so I didn’t want to have to think about marketability. I received a lot of compliments on the art, but also a good deal of constructive input about the story. Mostly I was told that if I really did want to break into the picture book market I’d have to start making characters or to try and really foreground a narrative. Fast forward two years and I’m sitting at my first SCBWI winter conference, watching Mike Curato talk about his own career path as an illustrator. He’s telling us about the little polka dotted elephant he couldn’t stop thinking about and how the little figure ended up launching his career. I see how his work evolved and I compare it to my own journey. I think about how I just left a very comfortable design position out of sheer faith in my creative abilities. I have a little internal freakout and feel like a fraud. I thought about my work and the characters that I had tried to bring to life over the past two years as a result of my thesis criticism. I felt unsure about how successfully I had done that. I wondered if I’ve been able to take advice, but I also became concerned about artistic integrity. That’s always been where my anxieties live. I’ve written about this before, but I am wary of the state of visual consumerism at all levels: apps, advertisements, newspapers, picture books. I get nervous the moment someone mentions “brandability”, which is often a conversation that large publishing entities want to have when it comes to their product: books. All too often I see vision sacrificed in the name of “the market”. I get it, it’s a powerful thing. But, when I think about making art for children’s books, I hope that I have been able to maintain my own sense of individuality while creating characters that people, specifically art directors, will want to buy. I hope that I’ve stuck the right balance. There’s an art browse at the conference on Saturday evening. All the conference goers, all the however hundreds of people, walk around a room and check out the art. During that time I had several conversations with fellow illustrators about this very issue of voice. I had looked through most of the portfolios by this time, albeit briefly, and I was getting nervous because I did feel like my work was, perhaps, not commercial enough for the audience. Maybe my voice with getting in the way of the content, just like my thesis project. Perhaps I hadn’t truly listened to the advice that I had been given. But still, many people were complimenting me on my style, which, to me, was interesting and heartening. Sunday morning came. That’s when, cruelly (so early! ), they announce the winners of the big portfolio showcase. This is different than the art browse. The portfolio showcase is a special private event that happens at the beginning of the conference. The art director illuminati of New York come and cast their judgement on your work and take any postcards you may have placed next to your little portfolio book. Then they leave in the dark of night and the illustrators collect their leftover things and sweat it out for the rest of the weekend. It’s a pretty great way to build tension, I must say. So at 8am on Sunday all of the illustrators were on edges of their seats. I had come to the conference with the basic goal of showing up (ninety-nine percent of the battle or whatever), but I had to admit that I was feeling very nervous by then. I was edge sitting too. Competing wasn’t my initial plan, but I had definitely gotten swept up. As they announced the secondary honorees, I saw Brook Smart and Jacob Grant stand. I recalled their work-very strong and beautiful. At that point I sighed, fairly certain that the award would go to someone else. I even had a few people’s portfolio’s in mind. But then they called my name. I wonder: What does this mean about the state of children’s book illustration? The market? Brandability? Judging by the amount of excitement I just experienced and my current email inbox, I can move forward satisfied that people/the market crave the imagery I’m creating. Being a commercial artist can be maddening at times. The line between the “artistic” and the “commercial” can be so indistinct. The nature of the role is often at odds with itself, but that’s actually what I like about being in the profession. The tricky thing about it all is balance. I’m still learning about that. I now set off in a new life direction away from the start-up world and empowered by this recent vote of confidence by SCBWI and all of my fellow illustrators and writers there. It all couldn’t have come at a better time. I had arrived on Friday feeling uncertain and raw, but left on Sunday transformed. Thank you to everyone who stopped to say “congratulations” to me-it meant more than you might have known. Here is a look at some of the images from my portfolio. You can judge their commercial viability for yourself. If you asked me about designing apps a year ago, I wouldn’t have known what to tell you. I mean, I like playing games and apps, but I’m generally more interested in visual narratives: comic books, films, graphic novels, children’s books. I am very curious about how human beings represent themselves and why we make the stories we do. I see so many screens everyday here in New York, just on the way to and from work. It can be unnerving at times: who isn’t creeped out by all the Candy Crush zombies on the subway? I love my phone, but am I too optimistic to want whatever is on my screens to enrich my life? I want screens to enrich other people’s lives, something beyond hyperactive short-term junk. Good, right? That’s why I work there. I’m concerned with the value of visual content because it affects my work as an illustrator. I really want the things I make to impact people in helpful, interesting and even magical ways. You can imagine how excited I was when Tinybop offered me the opportunity to illustrate The Earth, number five in the Explorer’s Library series. So I’ve just spent the past six months planning, designing and illustrating The Earth. Allow me to share my wisdom. I want to tell you a bit about why I made certain style choices, share a little bit of process, and articulate how challenging some of the simplest things can be. Perhaps it can help and inspire you in your own interactive endeavors. My Art=Game art? Probably not. If you were an art director at a game company, I would be dead last on illustrators wishlist. Why? I use a lot of texture in my work; I love fine detail and organic marks. I like atmosphere and mood, softness and subtlety-painterly qualities. I love books and prints, especially old time-y expressive styles. There’s a reason apps are not generally geared toward this kind of work: it often looks great as flat art, but is usually quite challenging to animate and even more complicated to get it to respond to touch. Let me take a step back. Generally speaking, interactive products live on devices: our phones, tablets, watches, and whatever new contraptions Apple dreams up. Therefore the art created for these projects should be digitally generated and very flexible -- able to fit on a number of sizes and look good at different ranges of sharpness. Additionally, device storage is a factor. You cannot make an app with huge art assets -- people will not be able to store your project on their phones. If you peruse the app store, you’ll notice that there are a lot of apps with very simple flat shapes and vector art. The nature of making art for apps simply requires that the artist be quick and iterative, flexible and spry. But this app is about the Earth! I wanted it to be full and lush and a little bit sophisticated. I needed some reference material. I needed proof that we could create something with a bit of nuance. So I spent a lot of time researching apps that valued production and dealt with nature or landscapes: Simogo’s Year Walk , Snoman’s Alto’s Adventure, USTWO’s Monument Valley, David O’Reilly’s Mountain all Vector Park apps, Toca Boca’s Toca Nature to name a few. I looked at them and tried to break down, visually, how these things were made. Most of these apps felt quite digital. The more I looked at these apps, the stronger I felt that The Earth should not fall into the what I call the “vector art abyss”-it shouldn’t be oversimplified or super flat, but it also shouldn’t be It shouldn’t try to be too realistic or appear too much like an infographic. Google Earth already exists and has cornered the market on that. We needed a style with more imagination, more whimsy. We ended up having long discussions with our developers to make sure that a textured, painterly style was possible while still having the processing power to create interesting and full interactions. We’re fortunate to have very smart and creative developers here at Tinybop, they’re always interested in finding new ways to innovate and make the game work in favor of the art. Original art test for a volcano in Earth. We also wanted to make sure we had the ability to make the app feel more organic: we needed water and lava to flow, rocks to tumble, and waves to crest and break. For those of you who are not developers or production designers you should know that these sorts of effects are uniquely challenging to build. These are all the sorts of details we had to consider and plan while figuring out how to structure the app. Each choice we made influenced our future choices a great deal. The content of the app informed its structure and vice versa. So to those of you thinking about making apps, or creating some sort of interactive visual project I’d like to emphasize this point: do the research and make plans. Think everything all the way through. Before undertaking something as complex as an app, it’s important to know what, why and how you want to make it. And it’s just as important to be prepared to change course. In my case, I needed to look at a lot of books. Why books, you ask? Content is only as good as its inspiration, so I needed the best collection that I could find. The Earth is a pretty big subject that has been covered in many different and interesting ways, and I wanted to keep an open mind. I visited the Tinybop library. I grabbed anything that was remotely relevant. I looked at a lot of instructional books from the 60s and 70s -- books about glaciers, rocks, minerals, water, air, and, obviously the Earth. I grabbed the huge Smithsonian's Earth The Definitive Visual Guide. I looked for compelling moments in nature, and sought to understand how this planet looks and works. When I got overloaded with information, I looked at fiction. I looked at a lot of children’s books. I found wonderfully inspiring content in Ed Emberly’s The Bottom of the Sea, Lotta Nieman’s Walk This World , Matthea Havey and Giselle Potter’s Cecil The Pet Glacier. These books all provided interesting ways of simplifying huge topics. They helped me figure out how to tell little stories about complex geological processes. Ed Emberly's The Bottom of the Sea. Lotta Nieman's Walk this World. Notice the pull-back tabs. As I thought more about designing the app, it became very important to think of fun ways to deliver educational content, just as these books did. It became all about balance: information and research content, style and visual content, and technical prowess. Fact and fiction. I made sure to draw accurate sliding plates, but I also made sure that we’d have a whale in the ocean to bring the app some life. Still, there are a lot of planned moments that didn’t end up making it into the app because of time constraints or because they were just beyond the scope of the project. This, perhaps, was the largest lesson I learned while making the app: the letting go. There are so many external factors that shape the process, it’s important to be able to adapt. Sometimes, I compared this project to working on a film, which I’ve also done. The nature of the work is so collaborative and incidental. Despite all intentions, the engineering of the work yielded very different results. You find yourself making many compromises, or coming up with very different solutions entirely, especially as the deadlines inch closer. It’s at the last moments that you find yourself most in need of that initial clarity and structure (wait, why was that important again? What was the point here? What are we trying to get the user to do?). There’s also the human factor. After all, people (and in our case, children) don’t respond well to the app, it’s simply got to adjust. That was my major challenge: understanding that the app is its own, organic product - making an app rarely goes as planned, yet strong and intense planning provides the best way forward, especially with a team. The initial strategy informs the creative choices each team member ends up making along the way. The stronger and more fleshed out that vision is, the stronger the ultimate product is. So spend time looking at the market, mapping out the narrative, gathering inspiration, making mood boards, and creating mock ups. Test the mock ups with real people. I’ll repeat: test the mock ups with real people. You will be surprised. My final advice: truly understand the thing that you would like to create and then start illustrating. In my experience, illustrating an app was more like engineering an image. I didn’t create concept art, I created art that would be broken down and used in the game so I had to consider that while I was creating the work. I found myself thinking about how the image would come to life as I was working; a thought process I rarely encounter when working on art for books, or my own personal work. I also found that once I started illustrating, I really couldn’t afford the time to rethink creative decisions, so I was glad to have done all of that research and reading before picking up my pen. So, as you start off on your own interactive adventures, I recommend that you constantly ask yourself “why” and “how”. The more answers you have ahead of time, the better off you’ll find yourself. Sounds simple, but it’s far easier said than done. Once you’ve built that strong structure, then trust that all that research, planning and iteration help make a product that is a positive contribution to visual culture overall. I’m up in the Catskills at Spruceton Inn. I’ve only been here for a few days. But it’s happened. I’ve made up my mind. I’m never leaving. Sorry Casey and Steven (Innkeepers). You’re going to have to drag me back to the city. Sigh. I’m here participating in Spruceton Inn’s first Artist residency. It’s beautiful here and it’s been ages since I’ve been able to sit and focus on my own work. I even hear frogs or birds or something chirping at night. Well, at least I hope its one of those things. It's been a while since I've been in the country. It sure sounds magical. Casey and Steven are Brooklynites who have escaped to the Catskills to start this Inn about a year ago. Steven’s a children’s book writer, illustrator, and Casey is a writer, designer, innkeeper, and, it seems, wonder woman. I’ve been spending some time chatting with them and their pup, Waldo. All the work they’ve done here is just so...impressive. I’m coincidentally here with a fellow artist resident, Alyssa Leanne Hoppe. She’s a fellow Brooklynite and very inspiring artist/illustrator/floral designer/prop stylist. We’ve been checking in on each other’s daily progress in the bar after hours. Together we all form a mightly creative community. What have I been making you ask? Well, I’ve been working on writing some children’s books and creating their dummies as well as some personal work-something I haven’t been able to do in a long, long time. I’m hoping to make a series roughly based on my trip to the desert last week-I’d like to be able to have another gallery show in Brooklyn soon. I’m also hoping the personal work will rejuvenate aspects of my editorial work-I’ve got projects lined up with Martha Stewart, Travel + Leisure, and Picador, all of whom all calling for natural images (surprise surprise). Glad I’m up here to remember what that looks like. Take a look yourself! It’s been gorgeous, fresh and inspiring. I encourage everyone to apply for Winter 2016! Thank you Casey and Steven for this retreat, I’m veryveryveryvery grateful. Very. Neenah Paper and Design Army asked me to design something, to celebrate my favorite city and Neenah's Classic paper line. I made a huge mask to celebrate Philadelphia. Welp, blogging consistently is quite the challenge for me at the moment. While I strategize about how to outsmart myself in this area, check out my Tumblr for for quick updates on my own work and things I find inspiring. I also show lots of process images on my Instagram feed. I sometimes make stupid jokes on Twitter. “That's wonderful to hear that you're considering going back to school. This question is different for everyone. It depends on one major thing: how well do you know yourself? Here’s a bit about my personal experience, since you’ve asked: I went to undergrad and got an English degree, worked for five years, traveled for one, and then went back for the Masters. I really, really recommend taking the time to work outside of school before starting graduate school. I cannot stress how much it helps you understand if you truly want to pursue illustration and how you want to do it. Heck, I came out of undergrad certain I would get a PhD in Cinema Studies and archival work. So you see the problem: how well do you know yourself? Working gives you the opportunity to test your theory. It will also help you understand where illustration fits in your life. Do you even know how you work? What environment do you work best in? Do you want to be a full time freelancer? Do you want to have a studio space with friends? Do you want to work for a company? Teach? Working, regardless in what field, may help you answer some of these questions. You don’t even have to work for that long-a year, maybe two. Just don’t get all stuck and comfortable on that consistent income. I went to grad school to take time to develop my voice and style. My work was undeveloped and unfocused before grad school, and I used that time to experiment and fail a lot. I also had gaping holes in terms of my knowledge about the illustration industry despite trying to teach myself for several years. I just felt like I was going in circles and never quite getting it. I’d encourage you to return to school if this is an experience you’re sharing. Since you’ve already gotten your BFA in illustration I’m willing to bet you know most, if not all of what I know about the industry and your skills are already well honed. If you imagine grad school will inject you with talent or be an opportunity to perfect yourself I’d say that is not good motivation. We obviously all want to get better at what we do. Honestly, that can come very quickly with commercial and personal work. Just plain old hard work and motivation. More food for thought: because of grad school I cannot afford to be a full-time freelancer just yet. I would like to be, but I’ll be needing to work for a while to make sure I have the security to do that. Or when I get my first book deal (hah!). Luckily, I love my job and they’re very understanding of the outside work I do. I don’t know what your money situation is, but student loans are a very serious thing. So sadly real. Grad school is great! But be certain you want to do it. It's really a time and place to experiment and play, develop new ideas and take the time to fail. That was important to me. It's not necessarily a place you go to and then come out a shiny new amazing illustrator. I'm still learning many things. Can you smell Autumn? I can. This is one of the things I love about August and the dog days: you can sense the cooling in the air, the leaves drying, the back to school supplies....I made a drawing last week for the New York Times that, I believe, encapsulates one of the feelings of summer. It turns out a lot of people liked it! I got a lot of requests for prints of this, and I've obliged. I am making a short run of 25, numbered and signed. Please be in touch if you would like to purchase one. Enjoy this last week before Labor Day! As you may know I graduated from MICA's MFA program last May. I've since been in the throws of debating whether I should strike out into the wilds of freelancing, take a teaching job, take a full/part time job etc. Then something fortuitous happened: I was offered a position at Tinybop. I've loved this company for a long time. They care a lot about illustration and making beautiful children's art. They've made such apps as The Human Body and Plants (obviously my favorite). So here I am at Tinybop! I'm very excited to be here and to be thinking about how kids think and learn all day. It's already been very inspiring for my own personal work so I think this was a good move on my part. I'm still working on a lot of freelance projects at the moment, but it's been fun to stretch my brain in different ways in this new place. I'm happy to be in Brooklyn too! Come say hi if you're my neighbor! So many life events of late! I recently returned from ICON 8-a conference dedicated to illustration. This year it was in Portland, Oregon. Good lord is that a beautiful place. Man, to live in Portland..I can't even imagine. Anyway the conference was a wonderful event. Hello to all of the people I met (what's up Carson Ellis??) and thank you to all of those who made it possible. If you cannot tell by looking at my art, I love the work of Carson Ellis and Jon Klassen. Who doesn't? They were two of the featured speakers. They were the reasons I attended this year despite the billion dollar flight across America. One of the worst things ever to happen is to respect someone's work and then to have your idolization dashed by a stupid personality. But, thank goodness, Carson and Jon are delightful folks and I am so so, so happy that I went. Thank you ICON and thank you Portland. I am planning to return to you someday. I've been having a bunch of fun dreaming about swimming these days. I grew up spending my whole summers by the pool. Now that I live in the city it's something I miss dearly. I was finally able to get to a friend's house in upstate New York this past weekend to experience the real thing, but up until then I've had to settle for thinking and drawing. I made this for my friend Sara, the creator of the blog Brown Paper Bag. A part of it will be the header for her blog for all of July. Nice! Welp, school is done. Done. I'm a full blown Master of Arts. My next direction remains unclear, but while I scramble to figure out what to do with my graduated self, I'm trying to create as much as I can while I can. Here's a piece that involves lots of praying mantises wandering around a field of chives. I'm considering making a book based off this. It turns out I really like drawing bugs. I can't think of a better thing to announce: this past weekend my first New York Times illustration made it to print in the Sunday Review. Art Director Aviva asked that I make a drawing for an article about home yard care and the damage its doing to our water supply. The writer, Diane Lewis, is a physician and founder of the Great Healthy Yard Project. I'm lucky that the article aligns with my own environmental interests. Though I don't have a yard at this time, I urge those who do to be conscious gardeners and lawn keepers.